Season greetings everyone! I believe that everybody has their own ideal ways to send Christmas greetings to their family members, relatives and friends. No doubt that in this modern technology, majority of people prefers to send Christmas greetings through email, greeting cards websites and send SMS by handset. 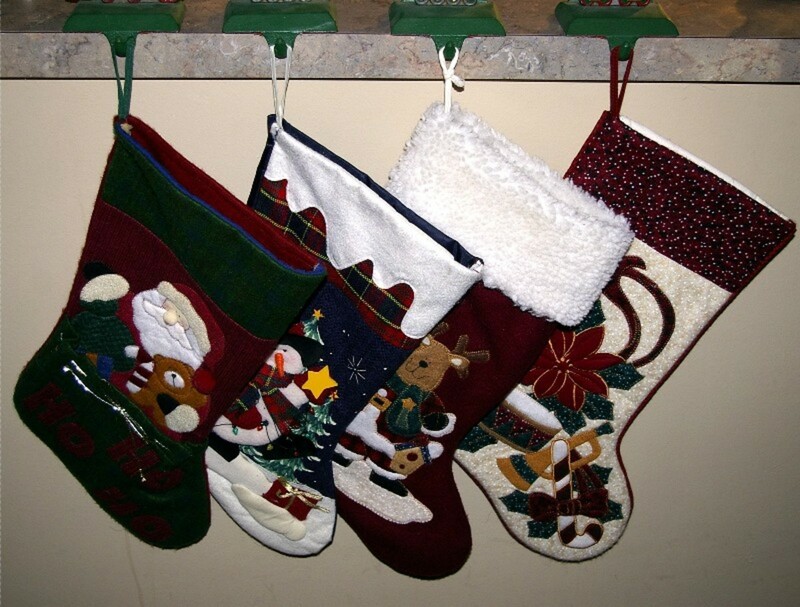 Thus, the recipient receives the Christmas greetings instantly, much to everyone’s convenience, promptly and saves time. 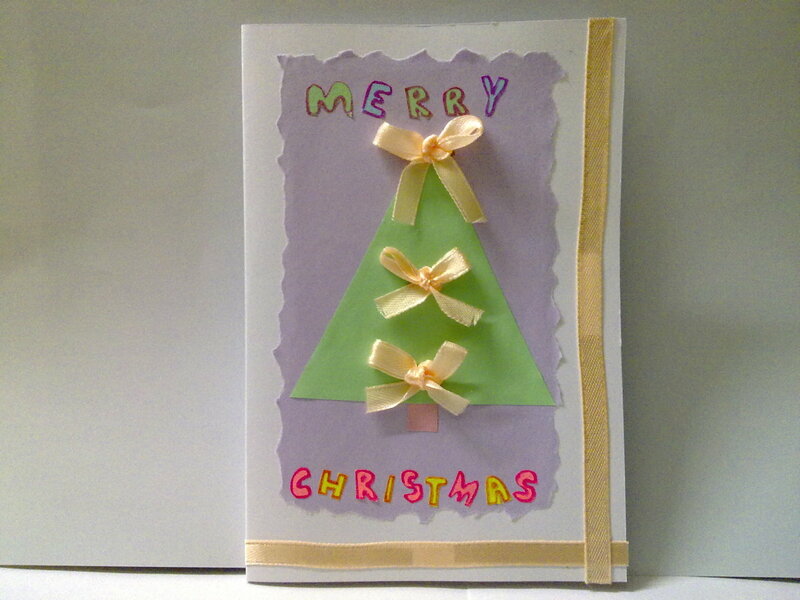 What is your opinion of this handmade Christmas Card? Cute bows and beautiful Christmas tree. Definitely will try to make one. No opinion. Don't intend to make either. Wonderful, pretty and easy to make. 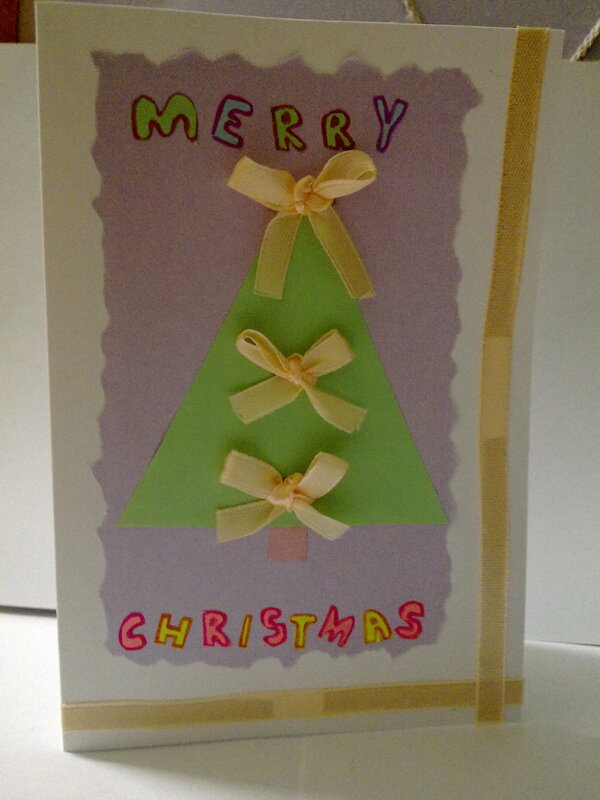 Why I chose to send handmade Christmas Cards? This time, I chose to send my handmade Christmas card rather than store bought cards. 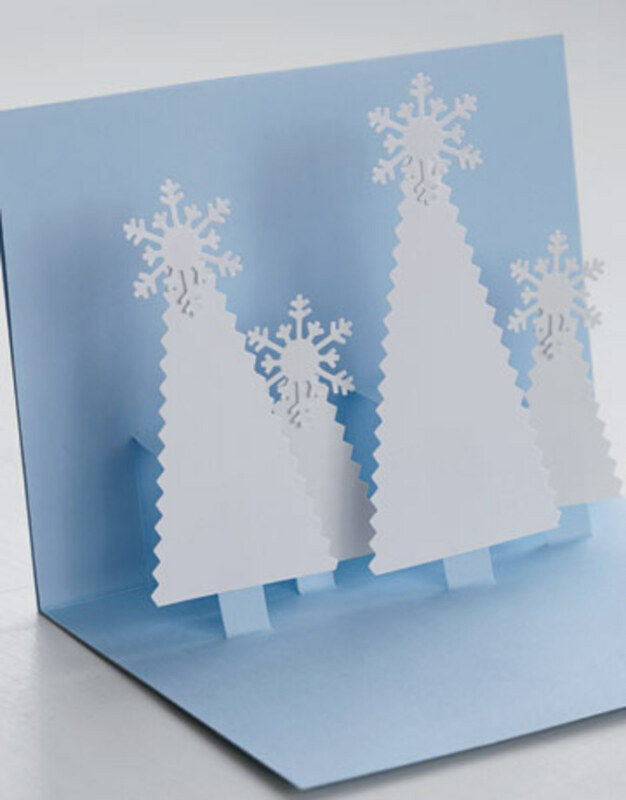 To send Christmas cards by mail is the most traditional method, shows appreciation and valuable friendship. 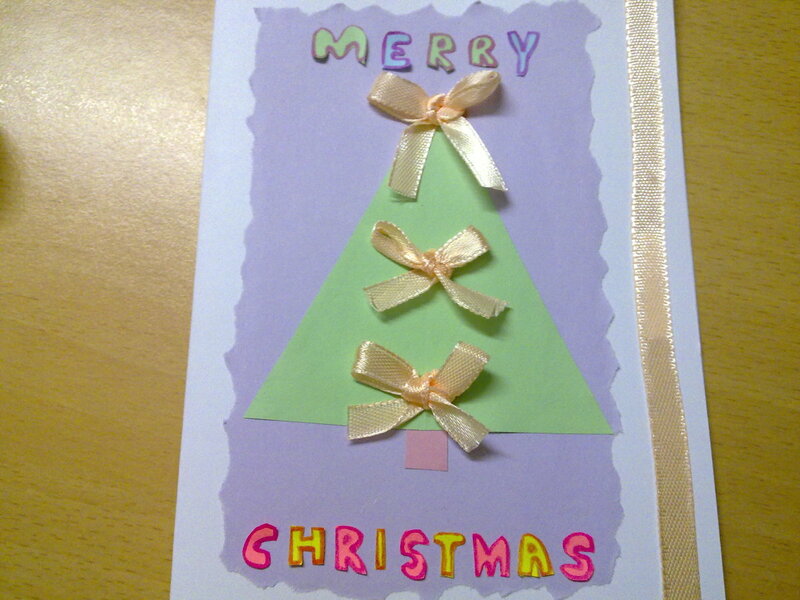 A handmade Christmas card is a magical card to me. It brings out thousand of words, signify warmth, love to the people we cared and cherish. In the past, I used to send store bought cards to my relatives and friends but I never receive a phone call or a thank you from them. 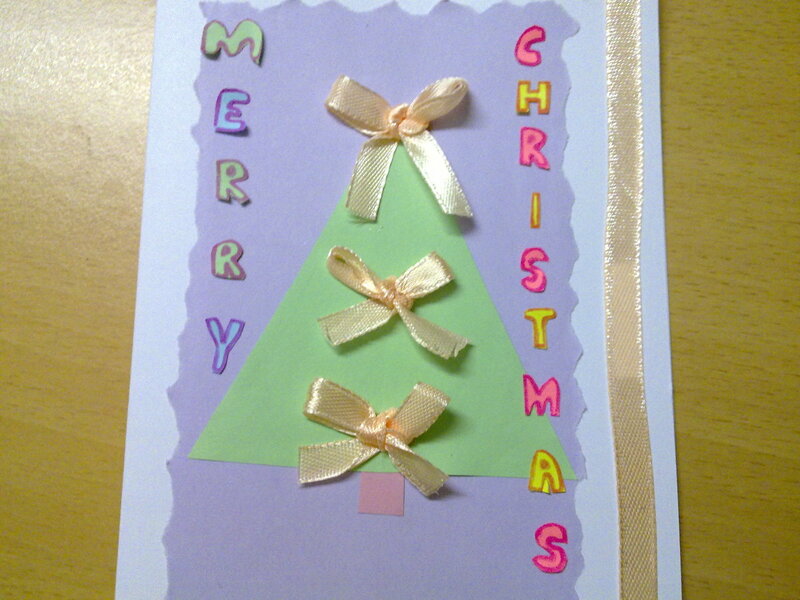 However, when I started sending handmade cards, they were pleased to receive something different from others and sent “ a thank you” SMS to me. 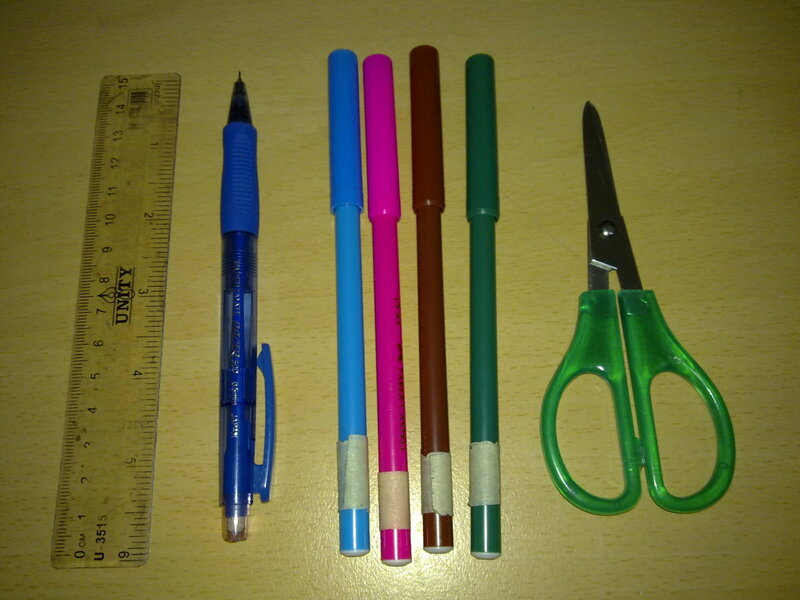 color markers for colorful wordings. I love the simple outlook of this Christmas card, a green Christmas tree with ribbons at the side borders, make the Christmas card resembles a present. Jagged sides from a color paper seems like a natural pattern to me. Pretty bows to represent the stars lighted on Christmas tree. Not forgetting comical letters brings out the joyful feelings. Try it out now and send it to your friends or someone special for this Christmas. I bet that he or she will appreciate your effort. Good luck and MERRY CHRISTMAS TO ALL !! Praise the Lord, Amen ! Most ribbons are plain in colors, usually the 7 colors in the rainbow. 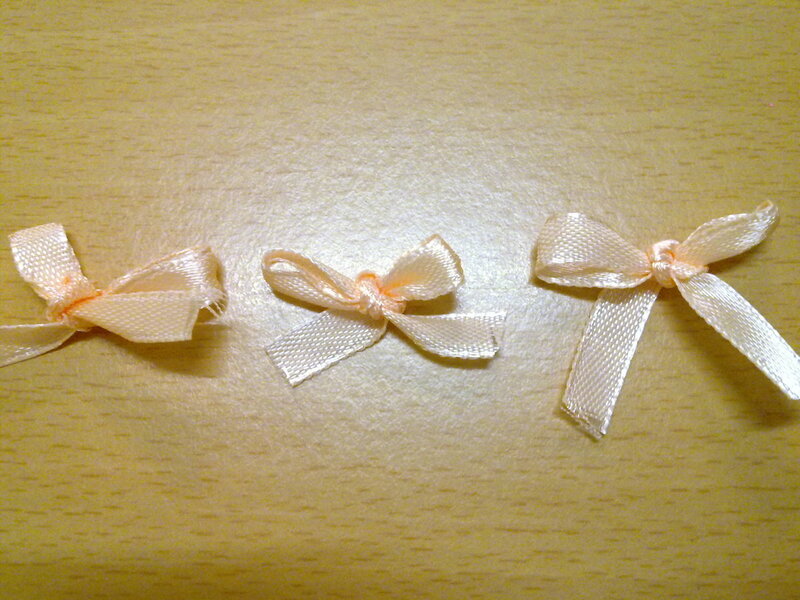 However, this Hipgirl ribbons are unique. It comes in different designs you can choose from. I like the polka dots ribbons which is suitable for Birthday cards, Easter egg ribbon for Easter card and the light green ribbon for Christmas cards. Its quality is fantastic, doesn't comes off the thread and easily glue to the cards. 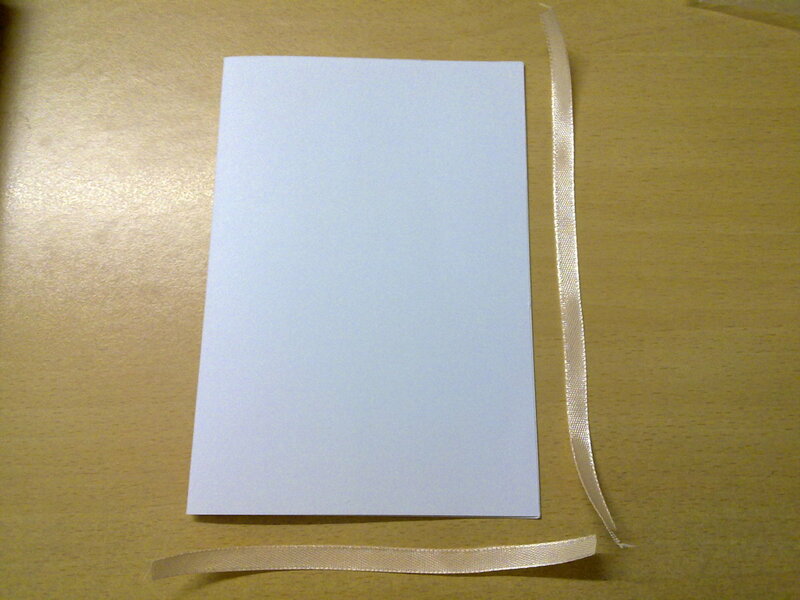 Choose a white card which weighs 120gm or more. 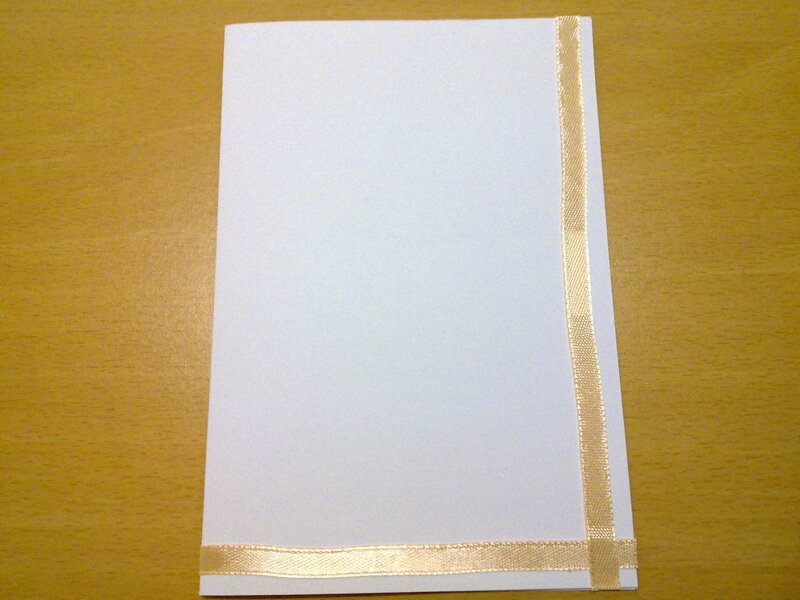 Matte or heavyweight card are suitable to make greetings card. Measure white card 6.5" x 9". 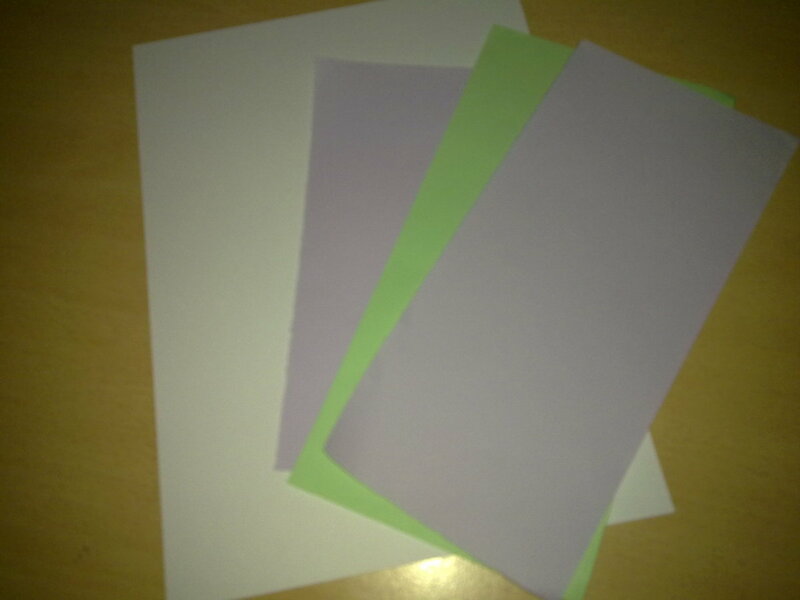 Choose any color paper that you like. ( I chose purple ). 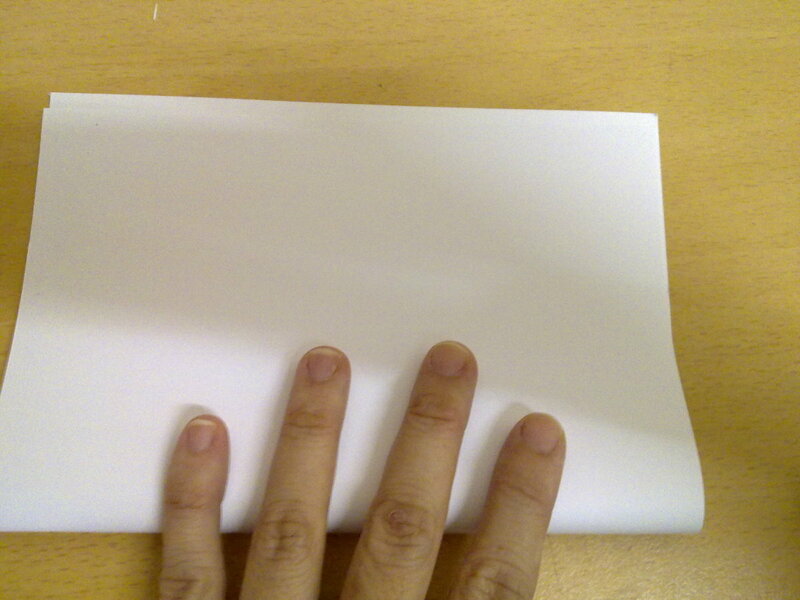 Measure and cut the size of the paper slightly smaller than the front of the white card. 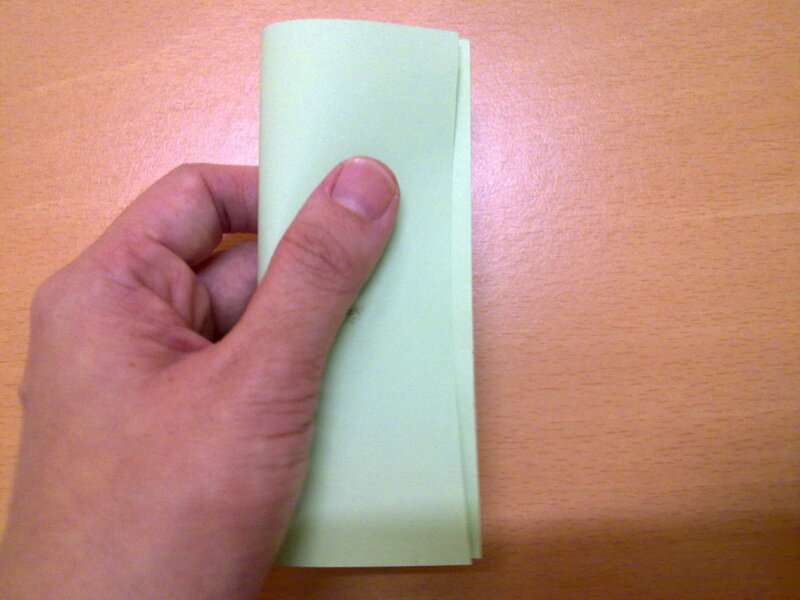 Use your fingers to tear all the sides of 4 borders. Do not tear too big. Tear them slowly and in small tears. It should look jagged ( zigzag ). Paste them on the front card, one of the right and the other at the bottom. Trim off any excess ribbons. 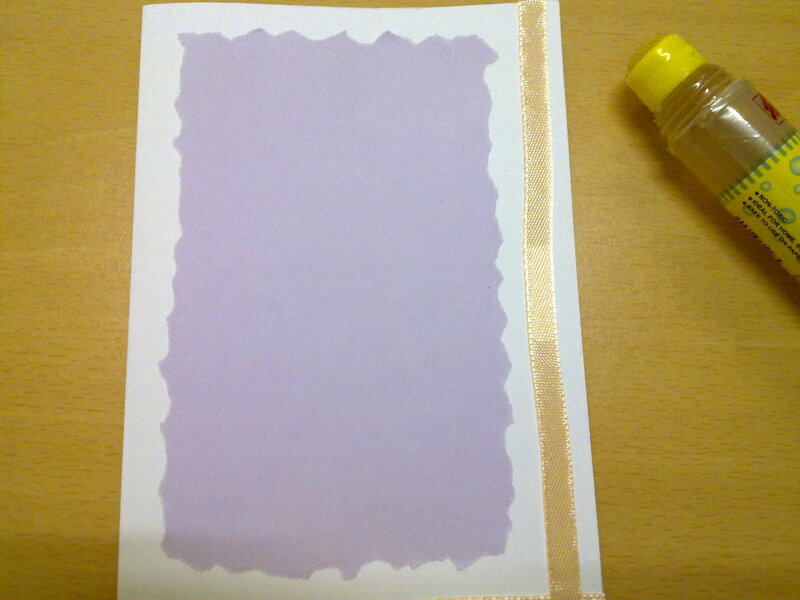 Next, apply some glue at the back of the jagged purple paper. 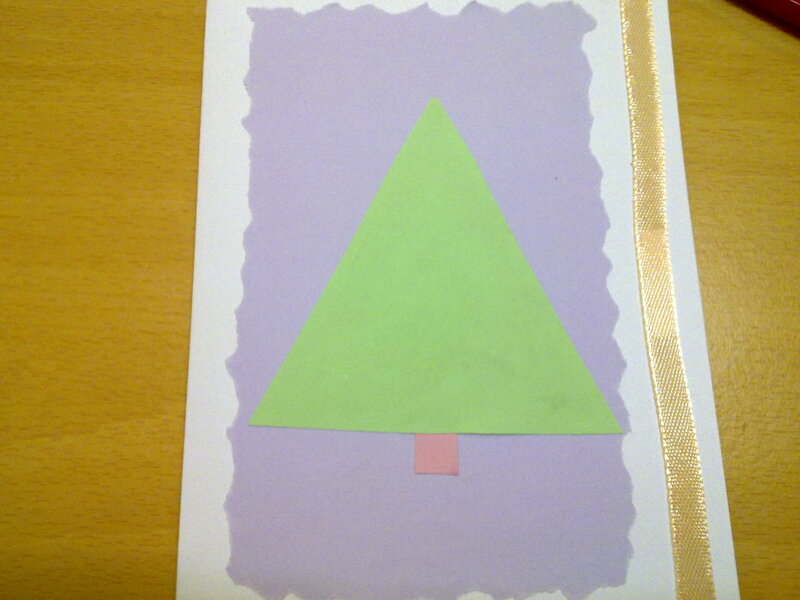 Paste the purple paper in the middle of the front card. 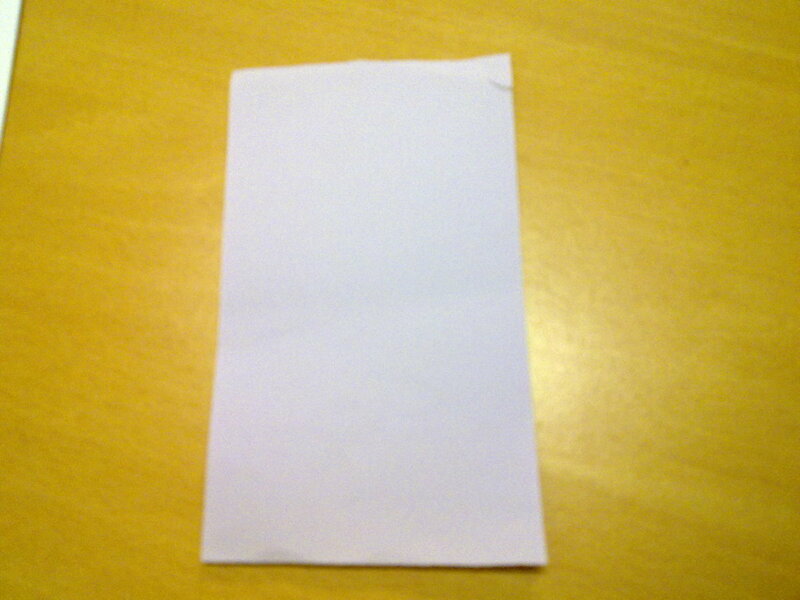 Choose a piece of green paper for the Christmas tree. 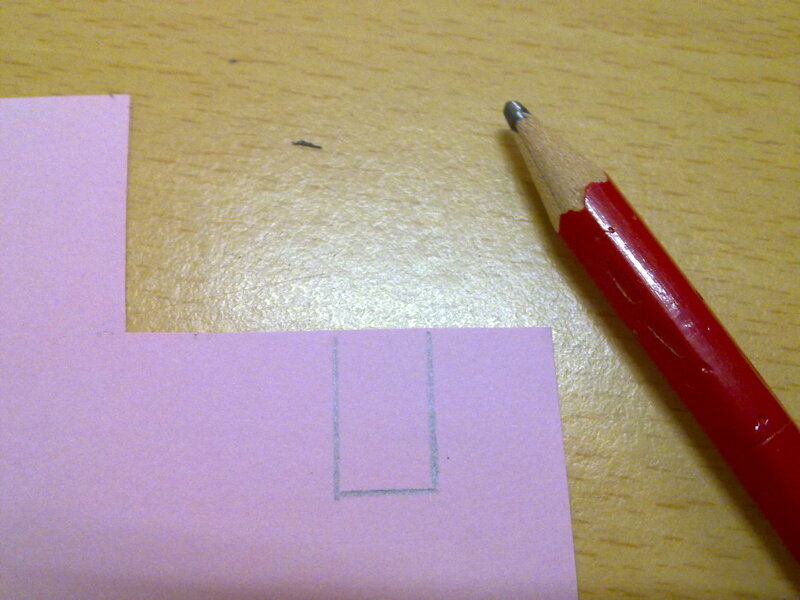 Cut out the size of the paper slightly smaller than the purple paper. 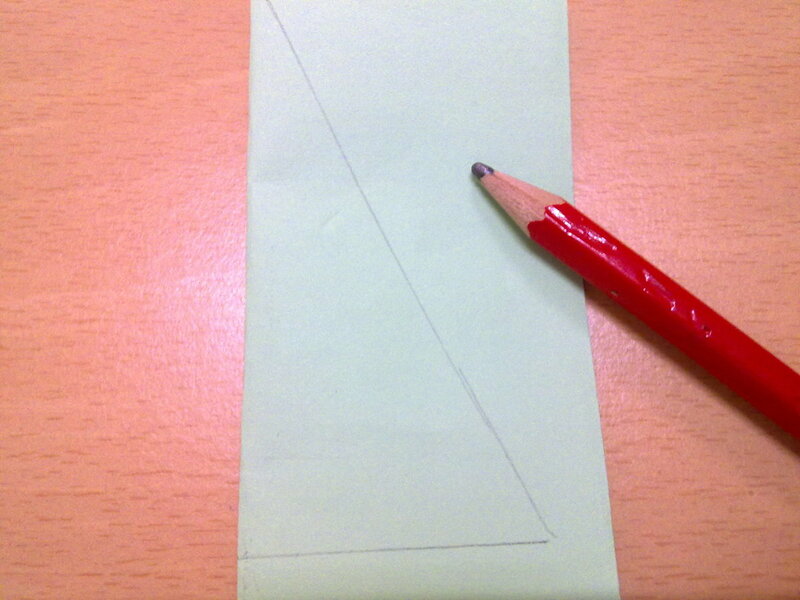 Draw a half triangle at the crease of the paper. 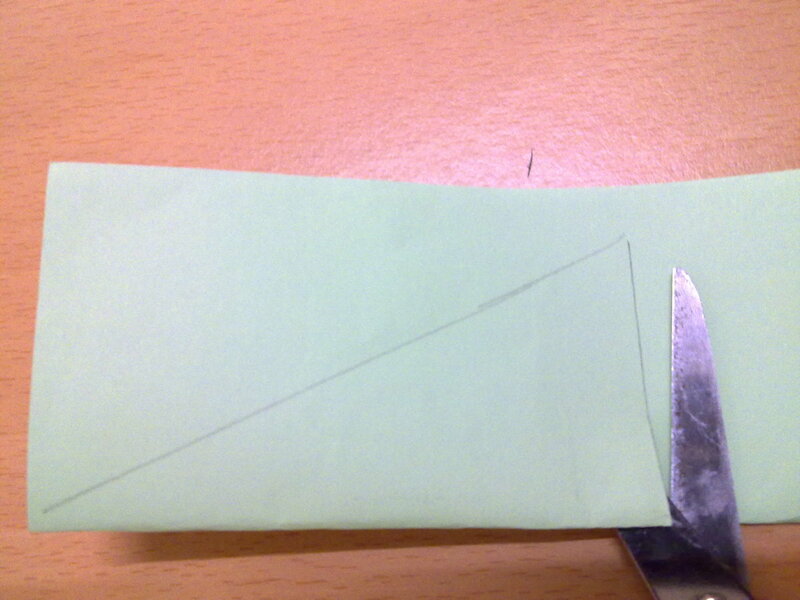 Cut out the half triangle shape. 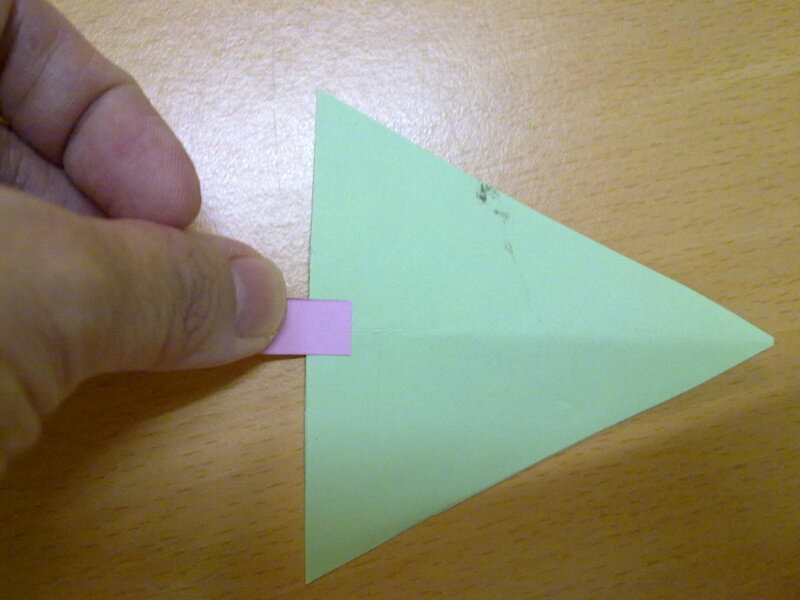 You get a full shape of a triangle. Use the excess purple paper to make the tree stump. Apply some glue at the back of the purple tree stump. Paste the tree stump at the back of the Christmas tree. Adjust according to the height that you desire. Apply some glue at the back of the Christmas tree and the stump. 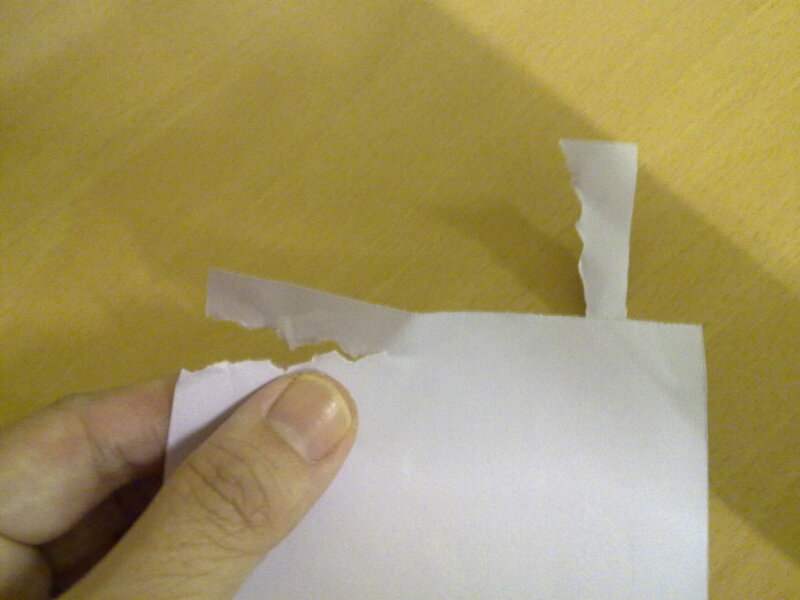 Paste it in the middle of the jagged purple paper. 2. Press "New" and then select "Blank Document"
3. Select "Insert" and then press "SHapes"
5. Pull the mouse cursor away to enlarge the triangle shape according to your desire length. Cut out 3 long strings of ribbon. Tie a pretty bow out of each string. Make sure that the knot is tight. Otherwise, it will come out loose. 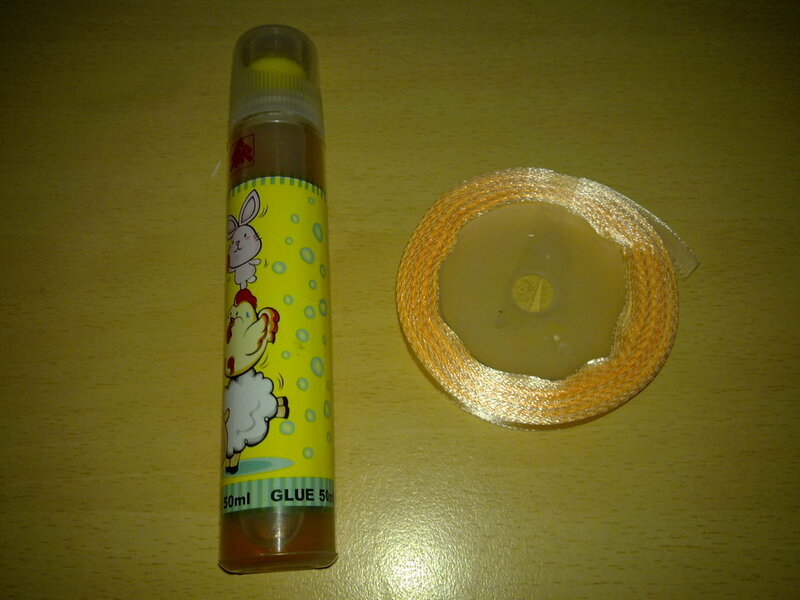 Apply a little glue or double-sided tape at the back of each bow. 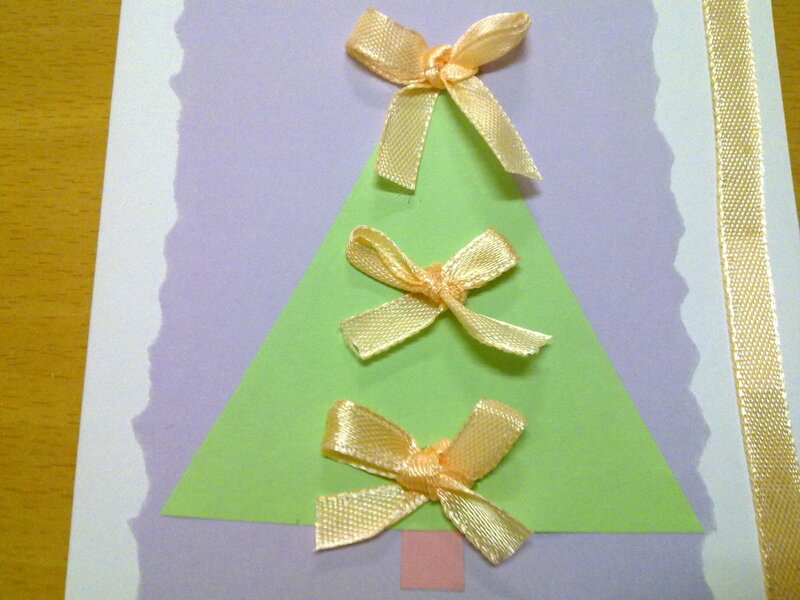 Paste the 1st bow at the tip of the Christmas tree. The 2nd bow in the middle. Next, the 3rd bow at the bottom of the tree. 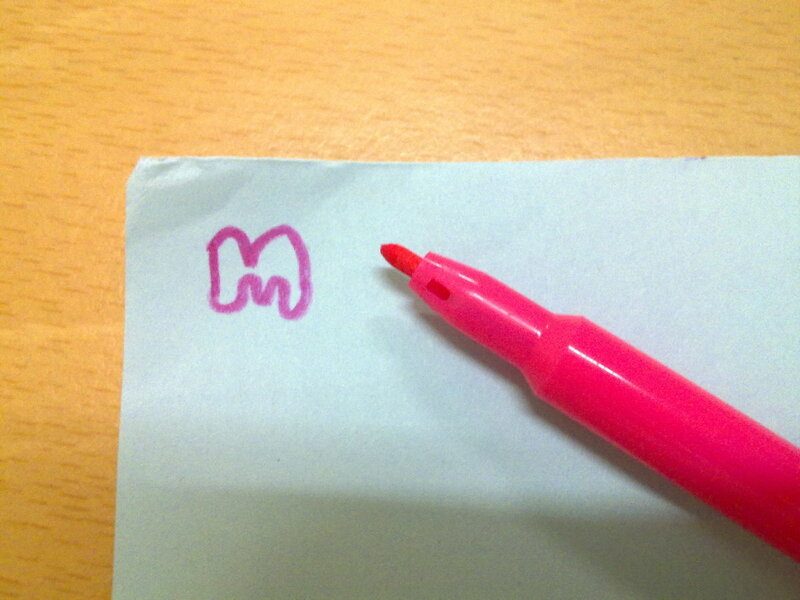 Draw the "Merry Christmas" alphabets with a marker pen on different color papers. Apply glue at the back of each alphabets. Paste the message "Merry" at the top of the Christmas tree and "Christmas" at the bottom. Use your creativity to paste the message. It can be vertical or horizontal, curvy or comical patterns. 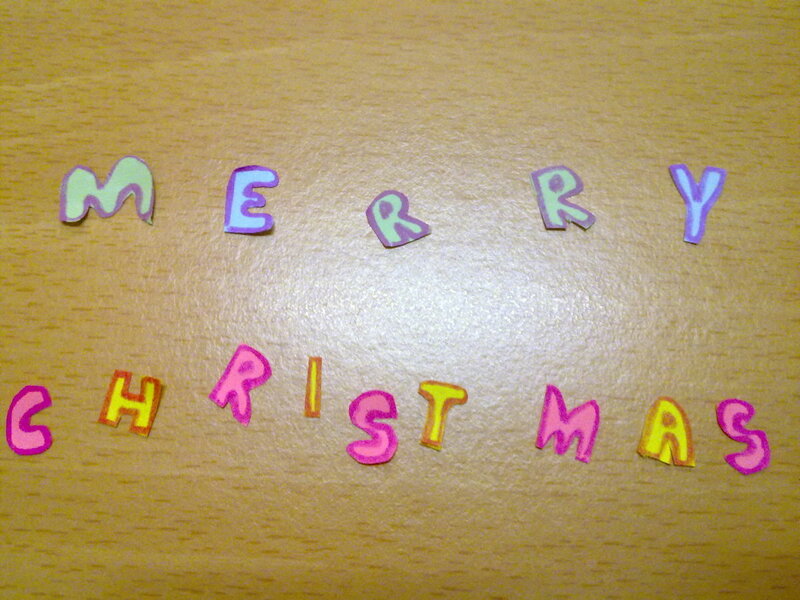 Otherwise, paste horizontal; "Merry" on the left hand side and "Christmas" on the right hand side. Create homemade Christmas gifts which are easy and beautiful. 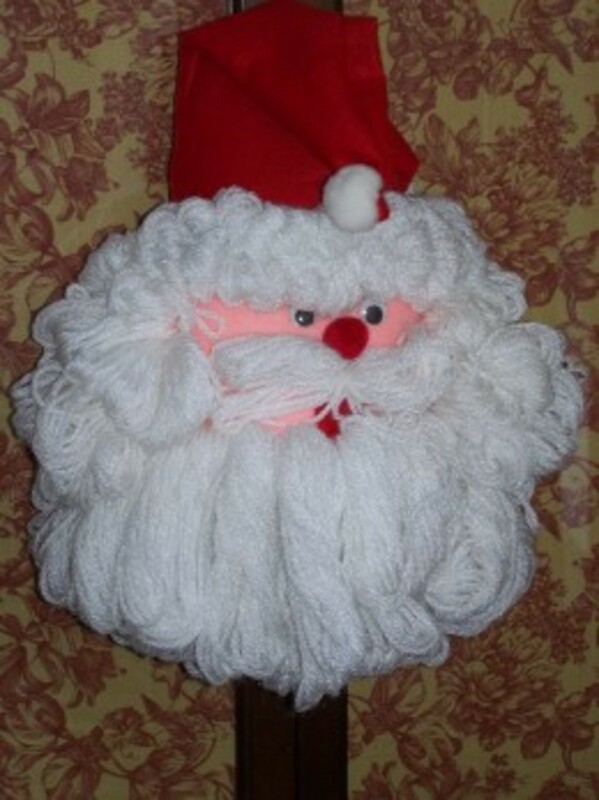 Handmade gifts are unique by reusing, recycle trash into useful gifts. Homemade muffins and cakes are healthy and delicious, full of love. If you want Santa to appear in your photo, use iCaughtSanta. It gives the impression that Santa is REALLY in the photo taken. This is the best Christmas gift especially for children who believe Santa Claus. Store bought Christmas cards are plain and boring. I love Peek A Boo Card that gives the recipient the feelings of a child, open up the card to see something special inside. Yep, i am sure your family will enjoy this craft. This would be a fun family night project. I think doing it as a group would inspire one another . Thanks for reading my hub. I am sure you will find the card easy to do. Best of luck! Yes, it is a fun craft to do with kids. You can modify the Christmas tree into something else for any special occasion. Cherio! Great idea for a family craft to do with the kids. And this can be done for any special holiday. Lovely step-by-step & cute card; this would be a great craft to bring out when I'm babysitting my friends' kids!! Thanks for sharing! !